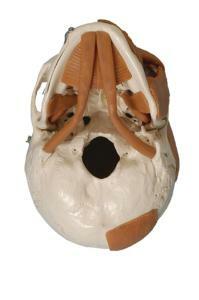 One side of this realistic, high quality skull model shows the attached superficial muscles of the face. Each muscle is constructed of a flexible, life like material, which ideally demonstrates the movement of the face and head as well as facial expressions. Structures are numbered corresponding to the labeled key card included with the skull. The skull features suture marks and dissects into two parts, allowing for an full interior view of the skull’s bone structure.